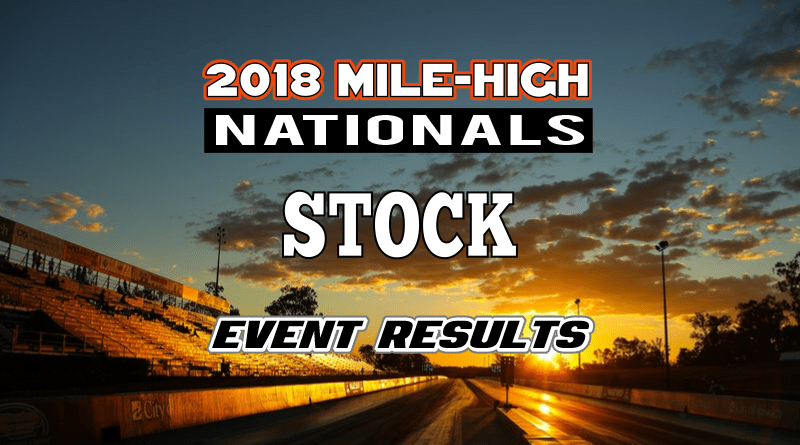 Morrison, CO – The 39th Annual NHRA Mile-High Nationals wrapped up recently at Bandimere Speedway. On Sunday afternoon, it was current NHRA Pro Stock superstar Drew Skillman holding the Stock Eliminator Wally over a field of 32 competitors. Skillman drove his 2012 Ray Skillman sponsored Ford Mustang to his sixth Stock Eliminator win and his 14th overall win after defeating two-time national event finalist Lane Weber in his 1978 Buick Skylark (yes, a V/SA, 16 second Skylark). Skillman used a combination of killer reaction times and an ultra consistent, and quick, racecar to capture the title. Drew averaged an .018 reaction time and had the reaction time advantage in every round. After benefitting from a first round red light from Scott Wells, Skillman found himself in an epic battle with Division 2 Stock/Super Stock racer Jeff Adkinson. After both driver’s left with double “0” lights, Skillman picked up the win by tapping the brakes to a .01 over 9.42 ET after Adkinson dropped hard at the stripe to a .05 over 11.02 ET. Waiting for Skillman in the third round was Kansas racer, Darrel Goheen. Both drivers put up solid .2 lights, but Goheen left Skillman too much room on the big end when he ran .027 above his dial. Skillman expertly rolled his opponent through the lights, taking an .011 stripe (approximately 2 feet) and running .02 over his dial for the win. In the semi-final round, Skillman turned a .02 starting line advantage over Nebraska racer Craig Maddox into another win light by rolling Maddox through by about five feet at the stripe after both drivers ran .02 over their dial-ins. Lane Weber, driving by far the slowest car in the class, started his run to the final round by picking up an easy red light win in round one. In round two, Weber took on the 2013 Ford Mustang of Mike St. Clair. After taking a .028 starting line advantage, Weber drove to a close win when St. Clair gave up the stripe allowing Weber’s .06 over 16.54 to light up the scoreboard. Waiting for Weber in round three was super hot Chris Chaney who would go on to win this event in Super Stock. Weber laid down .023 total (.012 RT, .011 over the dial) to leave Chaney mathematically ineligible after his .044 reaction time. In the semi’s, Weber took out former world champion Jim Hughes from Grand Junction, CO. As in the previous round, Weber laid down a great reaction time and solid run to freeze out Hughes. After a .052 reaction time advantage, Weber posted an .04 over 16.51 to take the three-foot win over the former champ. After several great reaction times in the earlier rounds, Weber posted his worst reaction time of the day in the final with a .098 light. Skillman, after waiting for just over seven seconds, posted a fine .036 light which gave him the upper hand heading to the stripe. Skillman took a chunk at the finish (.055) but managed to take the double breakout win when his .001 under beat Weber’s .008 under pass. Skillman continues to prove himself as one of the top sportsman racers in the country. He was spectacular on the starting line all weekend and used a quick, consistent racecar to drive himself to another winner’s circle. Congratulations to the Skillman family on their win!